CASE STUDY: How BankBazaar brought the banking and insurance sector online with 8 million customers? Home > Blog > Blog > CASE STUDY: How BankBazaar brought the banking and insurance sector online with 8 million customers? 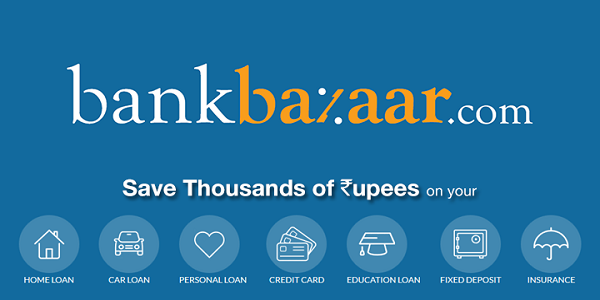 BankBazaar is an online marketplace for offering loans, credit cards, insurance policies etc. The service is accessible through website as well as app. Users can compare and choose through various services over the platform. Adhil Shetty, the founder got the idea of BankBazaar when once his brother Arjun and his wife Rati were trying to take a home loan in Chennai. They faced a lot of problems in loan disbursement like other Indian customers face. Main problem that Arjun faced was agent fake promises, opaque market and much paper intensive process. Users have to submit last 6 months bank statement and many other paper works. This was the point from which Arjun and his wife Rati got the idea of BankBazaar and then they along with Adhil discussed the idea and implemented it shortly. The founders invested their personal capital of 45 lakh to start the business in 2008. Once everything was on the way they soon grabbed angel funding of $1 million from AVT Infotech. The company started diversifying its products and services and again in 2011, it raised $6 million in Series A round of funding. In 2014, the company raised $13 million from Sequoia Capital and utilized it to educate customers about ease of banking. The growth didn’t stopped here and investors looked another opportunity in BankBazaar and this time Amazon made an investment of $60 million in Series C round in July 2015 which was used to end the paper work in the whole loan and insurance process by leveraging various platforms like Aadhar, eKYC etc. The journey of BankBazaar started in 2008 with an initial capital investment of 45 lakh with 6 members. Then the founders started approaching their seniors and colleagues. Many of them joined the team as the idea was superb and all together they built a great team. Today, the company has 130 full-time employees and 60 consultants. Starting the business was a hard task and they built the product with their initial investment. They had a hard time to get tie up first bank. But after many trials, first contract was signed up with ING Vysya bank and then soon HDFC Bank was brought on the platform. Today BankBazaar has more than 8 million happy customers getting service from 85 banks in 1332 cities. Some of their partners include ICICI Bank, SBI, PNB, Union bank, Axis Bank, CitiBank, Tata Capital, Standard Chartered, etc. BankBazaar We advertised aggressively on the internet. Our initial customers were from advertising on Google. BankBazaar is completely online platform and targets those who use online shopping more than traditional one for every purpose. BankBazaar focus more on its online presence rather than to be in traditional marketing. Thus the company used Facebook and Twitter more to gather its audience. BankBazaar understands the power of content and hence play with content over its Facebook and Twitter page. Currently Facebook has more than 6.3 lakh fan following while Twitter has 11.8K followers. LinkedIn page has more followers than its Twitter page with 17.8K followers. BankBazaar was started to bring transparency to the whole loan process and minimize the paper work involved in the whole process. The company used electronic system to give best deals to their customers. The process was simple. Customers just have to choose a deal, apply for the deal and get approval from the bank in 7 minutes that normally takes days. BankBazaar gets commission from the bank and don’t charge anything from the customers.